Taking photos of yourself has become so popular that even the Oxford dictionary recognizes the word “selfie” as an official word. The selfie craze has helped create hundreds of photo apps, but only a few become popular. One such app is called “Frontback,” which has gained popularity in the last few months on iOS. Today the app was finally released for Android users. What’s all the buzz about? 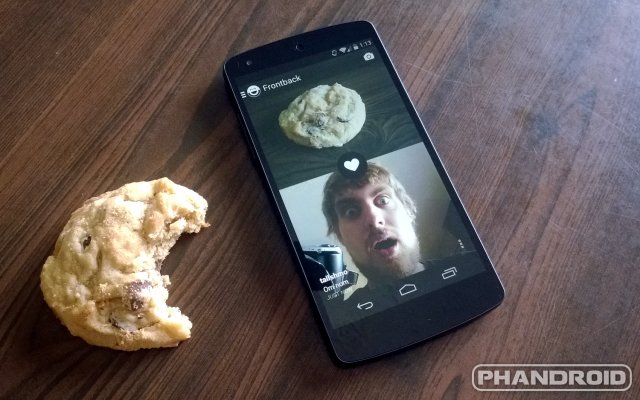 Frontback is selfies, emoticons, and regular photos all in one. The app allows users to easily take a photo with both the front and rear cameras, then stitch them together. The result is a photo that shows what you’re looking at, and your reaction to it. You can easily tell a short story about what you are currently doing and feeling without saying a word. Instead of just sharing a photo of something crazy with the caption “OMG” you can share the photo and include your “OMG” face. Frontback allows you to add friends and view their photos in a news feed along with curated “Staff Picks.” The photos can also be shared to your favorite social networks. If you’re looking for a fun way to share selfies this is the app for you. Download it below for free from the Google Play Store.